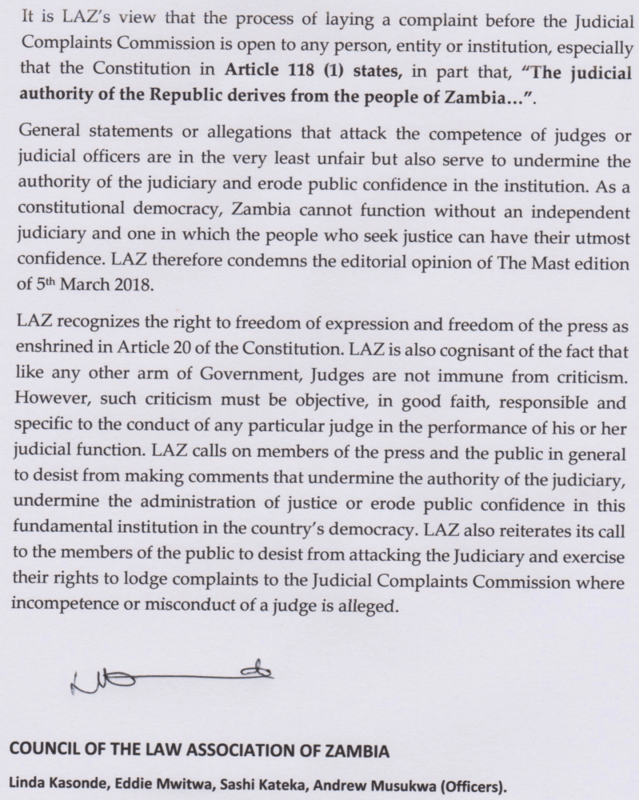 The Law Association of Zambia (LAZ) has condemned the editorial opinion that appeared in the Mast Newspaper of March 5th, 2018 calling for the Scrapping of the constitutional Court. In a statement released to the media yesterday, the Council advised that those who have issues with the Judges regarding their experience and competence to follow the laid down procedure in addressing their concerns. The council further said that the continued attacks on judges serves to undermine the authority of the judiciary and erode public confidence in the institution. On 5th March, the Mast Newspaper run an editorial alleging that the Constitutional Court had failed to justify its existence and must be scrapped. And most of the cases being handled by these inexperienced and incompetent Constitutional Court judges could be better decided by the Supreme Court. For instance, what is constitutional about electoral malpractice? Electoral fraud is not a constitutional issue. What provisions of the Constitution are in question under an election petition? The inexperience and incompetence of most of the judges of our Constitutional Court is bringing the whole judiciary into serious disrepute. Judges should aim to fairly administer justice in their everyday practices; however, our Constitutional Court judges are actually inhibiting the fair administration of justice through this lack of experience and competence. The experience and competence of our judges is paramount.